When Josef Jakobs was captured near the village of Ramsey on 1 February, 1941, several tablets (pills) were found in his possession. The British Security Service (MI5) thought that they might be useful for secret writing. Jakobs denied this and said that the pills in his possession were codeine and aceticone (both useful for coughs) and pervitin (to help one stay awake). On 5 February, an MI5 officer sent the tablets to Lord Rothschild of B1C who was in charge of the Explosives and Sabotage section. Rothschild forwarded the tablets to the National Institute for Medical Research in Hampstead, London where they were tested. Later, on 25 April, 1941, the tablets (slightly reduced in number) were sent to the Scientific section of the General Post Office for additional testing by H.L. Smith esq. The first set of tablets were contained within a small aluminium screw-capped tube (3.6 cm long and 1.1 cm in diameter). The tube held 25 small white tablets and 2 slightly larger, heavier white tablets cross-marked to facilitate partition into quarters. The February tests concluded that the tablets were a cerebral stimulant similar to Benzedrine, which could be used to keep someone awake. The tablets had been ground up, diluted in water and injected into mice. The mice went into a state of excitement for several hours, a reaction that was similar to what happened when they were injected with Methedrine hydrochloride. Further tests indicated that the tablets were N-methylbenzedrine. The April tests concluded that the the tablets were mostly sugar but included a non-alkaloid substance such as strychine, none of which would be useful in keeping one awake. 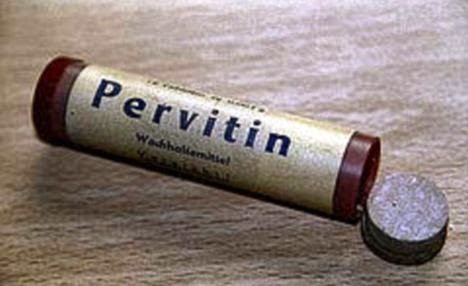 Jakobs had said that one set of tablets was Pervitin (Methedrine) to help one stay awake. Both Benzedrine and Methedrine are amphetimines. Methedrine is actually a methamphetamine and is commonly known as “speed” today. In low doses, Methedrine increases self-confidence, concentration and the willingness to take risks, while at the same time reducing sensitivity to pain, hunger and thirst, as well as reducing the need for sleep. Methedrine was given to German soldiers to increase their alertness, while the Americans favoured Benzedrine. The second group of tablets were contained within a torn wrapper with red printing (W.S.P.XI ) and included three white tablets and a portion of a fourth. Both the February and April tests concluded that these tablets contained codeine and phosphate and could be used for coughs. Jakobs said that one set of tablets was codeine, a cough cure. Codeine phosphate is an opioid and a mild pain killer. It can also be used as a cough suppressant and to treat diarrhoea. The third group of tablets were contained within a wrapper of grease-proof paper with black printing (V.Z.). The five grey tablets were of obviously heterogeneous composition. Both the February and April tests concluded that the tablets contained sugar, ammonium chloride and a vegetable extract (possibly liquorice)--and would be useful for coughs. even for a strong cough"). Jakobs said that the third group of pills were Aceticone – most likely a mis-spelling of Acedicon (sounds the same) - trade name of the drug Thebacon. Acedicone is a hydrochloride salt (such as ammonium chloride) used as a expectorant in cough medicine. The scientists concluded that none of the tablets contained a secret writing compound and, in fact, contained too much sugar and starch to make them suitable for secret writing. It turned out that Jakobs was carrying genuine medicine which would not be used for secret writing.